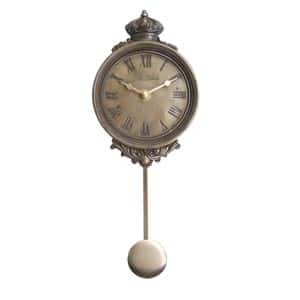 The New Haven Cold Cast Bronze Crown Pendulum Clock adds just the right touch of antique artistry to any home or office. It would make an elegant gift that is likely to be treasured for a lifetime. This handsome pendulum wall clock is artistically hand carved from cold cast bronze for a look that is seemingly aged to perfection. The pendulum is made of an antique bronzed aluminum to complete the look. A wonderful conversation piece, this unique clock is crafted with the highest quality materials and expert workmanship it could even become a family heirloom in generations to come. Its beautiful details and magnificent style make it worthy of adding to any collection. Since this New Haven pendulum clock is tastefully designed to compliment virtually any decor, and its small size ensures that it will fit well in any area as a stand-alone piece, or as part of a collection, it is perfect for gift giving. An impressive clock for the price, this piece would make an excellent gift for family members, special friends, or office associates. Order yours today!